All of my Great Grandmothers were quilters, my Grandmother was a seamstress and my Mother is now also a quilter. I’ve had this love of sewing passed onto me through the generations. I love this artform and feel that it is a tradition that we must continue to teach and pass on for future generations. Quilts can be beautiful works of art or warm and comforting layers of love or both! I have memories from when I was a little girl of laying under a heavy quilt that my Great Grandmother made. I remember the feeling of warmth and comfort as I would snuggle under that quilt and the fascination of the tiny flower print in cranberry pink that covered the back. That quilt is long gone and I am always searching for that perfect cranberry pink fabric for the back of my quilts. I am a self taught quilter and I have been quilting for over 25 years and discovered my love of free motion long arm quilting in 2012. I have studied painting, drawing, pottery, sculpture and theater, but now with the long arm I have found my new paint brush! I am a free hand quilter working on my 2012 Innova 22” Long arm machine with Lightning Stitch regulator and I use Pantovision for hand guided pantograph quilting. I do not use a computer so there may be some imperfections character in my quilting, but I always strive to do my best. I live and work in a smoke free home, but I do love my cats! I have a safe place to store your quilt while I am not working on it, but if you are allergic to cats I can recommend a cat-free long arm quilter for you. Congratulations to my fabulous customers on their winning quilts at the St. Andrew Bay Quilters’ Guild Quilt Shows. Latimer Farms won 1st Place and Best of Show in two persons bed size category. Dresden Plate – 2nd place in the two person bed size. 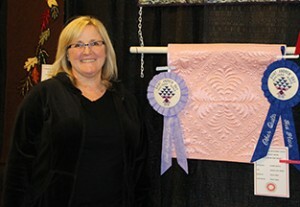 Aunt Bea’s Parlor -1st place in the group category and it also won the Bobbie award for handwork excellence. The embroidery was done by her daughter Stephanie Cox Wade.